A baked potato is often the side of choice for grilled chicken or steak. The most common toppings for a baked potato include butter, sour cream, cheese and bacon -- all of which decrease the nutritional value that a potato has to offer. If you choose the right toppings, according to the book "200 Superfoods That Will Save Your Life," baked potatoes are one of the healthiest foods you can eat. A baked potato with the skin is an excellent source of dietary fiber. These indigestible carbohydrates are a source of several important health benefits. A high-fiber diet helps keep you full so you are less likely to overeat, eat unhealthy foods or gain weight. Fiber also encourages your digestive system to work efficiently so you are able to digest your food, distribute nutrients throughout your body and eliminate waste easily. Eat your baked potato with some freshly ground black pepper and a dash of sea salt, or add some black beans and a dollop of plain high-protein yogurt. A plain baked potato contains no fat, making it a much healthier option than French fries, fried potatoes or butter-roasted potatoes, which are generally high in saturated fat. You can create a nutritious, low-fat and tasty baked potato by opting for salsa or low-fat cottage cheese over butter, sour cream and bacon. Fresh salsa made with tomatoes, peppers, onions and garlic is a flavorful, low-calorie topping. Chopped green onions stirred into low-fat cottage cheese is a heart-healthy combination that will also boost your calcium and protein intake. 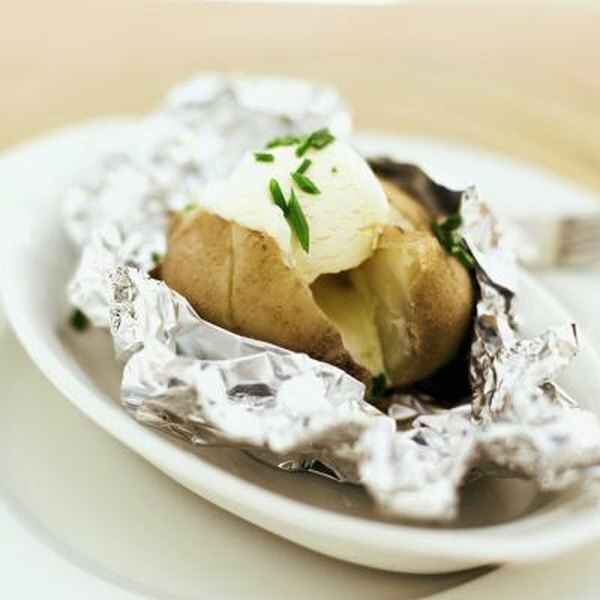 One baked potato with the skin contains about 700 milligrams of potassium, or about 21 percent of the mineral's recommended daily value. Potassium works with sodium to regulate your bodily fluids, which is what allows your heart, muscles and nerves to function normally. Broccoli and low-fat melted cheese are a nutritious topping combination for a baked potato that will add calcium and additional potassium to your meal. Alternatively, bake a sliced potato in a shallow oven-safe dish with some skim milk and reduced-fat mozzarella cheese for a low-fat, potassium-rich version of scalloped potatoes.